Tallin, Estonia – We are announcing a breakthrough in our journey at Digital Ticks. Barely 40 minutes into our ICO pre-sale, our token sale is sold out! Public Sale announced for 15th April 2018. When we started our Pre-ICO on 25th March, we believed that it definitely would be a success but we couldn’t have predicted what has happened, 40mins and all the tokens for Pre-ICO has been sold out. Digital Ticks has reached presale token cap of $5.7 million in just 40mins since it opened. 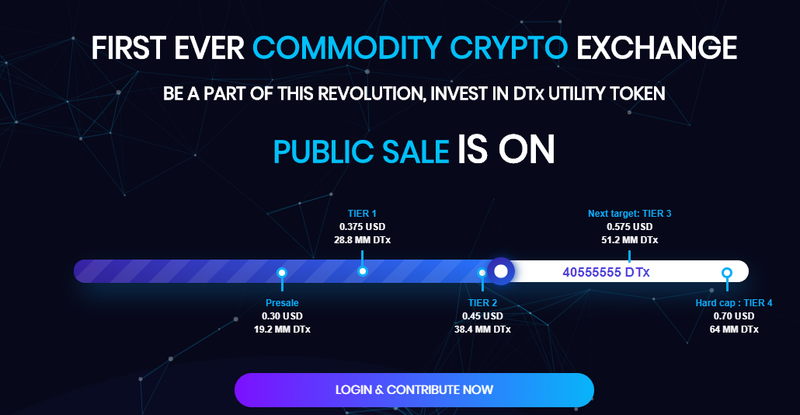 Visit Digital Ticks to get details about Public Sale Token. Combining decades of experience in Finance, IT Development, Marketing and Licensing, they seek to address important pains associated with the current crypto trading on major platforms using the latest technology in trading and innovation. We take this opportunity to sincerely thank each and every one of the early participants who supported us in such a large number and confirmed we are on the right track. There are a lot of goals and challenges ahead of us. We commit ourselves to follow the roadmap plans, taking into account all the principles of transparency, and of course: your advice and support. From the time the smart contract evolved with the Ethereum blockchain, several industry-based blockchain ideas have been springing up. However, crypto has only been traded in crypto-to-crypto or crypto-to-fiat pairs. Digital Ticks wants to create, for the first time, a commodity-to- crypto trading option that allows a direct link between crypto to world commodity markets. And to do that, they envision a situation where they will provide more than 2000 cryptos trading in their exchange with more than 200k BTC worth of daily volume, with pairing options to run from Gold, Silver and many other tradable world commodities. They hope to give an early bird free-of-fees trading in the early stages of operation. The big news here is that Digital Ticks presale was over 40 minutes after it started on March 25th, 2018. They intend to use the money thus raised to fund the establishment of the platform as highlighted in their website. The Public sale will start on April 15th, 2018, when the price is expected to increase marginally from $0.30 to $0.37-$0.70 depending on the tier one is buying at. On the platform, you can trade either as a maker, providing liquidity for the market, or a taker, placing actual trades. If you refer your friends to the platform by sharing your link, you will be getting 5% of all proceeds the platform makes from their trades. Digital ticks will give an early bird free trading holiday. To fund the rest of the roadmap especially the marketing of the platform, public token sales will be availed in 4 tiers, with price increments ranging from $0.37 to $0.70. The token sale is expected to be completed on 15th May 2018, with a hard cap of $30 million reached. The company will burn all remaining tokens once the hard cap is reached, and will routinely use buybacks to reduce the token in circulation and increase the token’s market value. The ICO begins on 15th April 2018. The tokens will be available in four tiers. Already, there are contributions that have been sent to Digital Ticks awaiting the opening of the ICO. Digital Ticks have confirmed that this money will be accepted and kept in their backend cold storage, awaiting the opening of the ICO. The funds will then be expended on purchase of the tokens on a first come, first served basis. There are a lot of enquiries on their helpdesk as we speak, and the team will try to answer all queries as much as possible. However, you can rest assured that all money deposited can either be used to buy the tokens or claim a refund immediately as and when requested. The moment the debate starts about commodity-to- crypto pairings on exchanges, everyone will have the chance to participate in creating a mass adoption of the blockchain technology as a means of exchange. But the main advantage that Digital Ticks brings is the ability to trade crypto with real-world commodities for the first time.